Have a spooky half term! Castleford: Weeks commencing 23rd October & 30th October 2017. Milton Keynes: Week commencing 23rd October 2017. If your holidays differ from these dates please do not hesitate to contact us on 0333 0030520 and we will look at organising something for you. 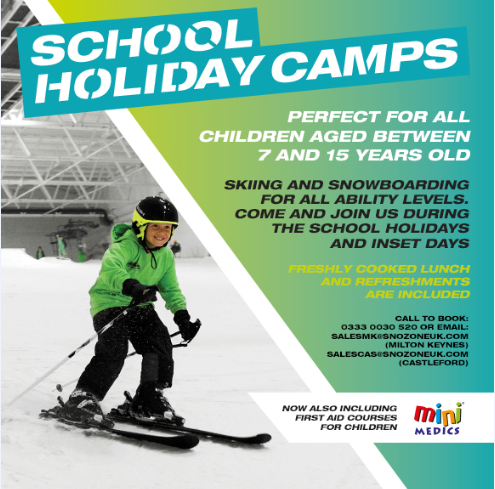 The Snozone school holiday camps enable children aged 7-15 years to keep fit, learn a brand new sport, meet new friends and learn a brand new life skill through our mini-medics – an accredited first aid course for children! Each day is packed full of fun and is excellent value for money. Starting the day, your child will learn to ski or snowboard with our fantastic snow school Coaches, followed by lunch and then either heading back out onto the slopes or take part in fitness drills and then a mini-medics session. The camps are available for beginners or experienced skiers and snowboarders. Refreshments are included. Snozone Members receive priority booking & a 15% discount. For bookings or enquiries please call 0333 0030520, or email mailto:salescas@snozoneuk.comfor Castleford or mailto:salesmk@snozoneuk.comfor Milton Keynes. We have freestyle features on the slopes on Thursday and Friday evenings. From rookie to more advanced there is something for everyone. Head over to our freestyle pages for park plans and more information. Enjoy quality time with your family during the school holidays by keeping active and having fun on the snow. Our spooky sledging sessions are available every day during the holidays however they do get very busy therefore we recommend booking in advance. Check out Family Fun on our website. We offer a number of options to learn to ski or snowboard. Ski lessons are available to those of 3 years and above, snowboard lessons are available to those 7 years and above. For details on lessons, head over to our Learn to Ski page or our Learn to Snowboard page.